Team SolarMobil would like to thank all its followers, mentors, sponsors and benefactors on the successful launch of our beloved car – SERVe (Solar Electric Road Vehicle). The team is grateful to Manipal University and Manipal Institute of Technology for nurturing the talents that constitute the backbone of the team. The institution(s) have been our primary benefactors since our inception in 2011. SERVe was launched this April in Bangalore and unveiled at both Tata Power Solar and the FKCII Green Summit, 2015. As is evident from the extensive coverage we received from acclaimed news dailies and online publications such as Times of India, NDTV Auto, BBC Auto, and ScoopWhoop to name a few, SERVe has been able to capture the country’s imagination right from the onset. SERVe features aerodynamic curved design and runs on solar energy from its curved solar panels. The team received constructive criticism and was lauded by industry experts for its efforts. SERVe is India’s first passenger solar electric vehicle which uses clean and free fuel with zero emissions and zero noise pollution. It has a high strength chassis and is lightweight. SERVe has an aerodynamic and aesthetic design obtained from the cut section of a tear drop. Custom made curved solar panels are used with energy generation at 17% efficiency. Further SERVe is energy positive, which basically means the car can not only generate enough energy for its own use but also supply power to an external grid. SERVe has been able to showcase that passenger solar cars are not only a possibility but a necessity of the not so distant future. Imagine a world without all the depleting fuel we feel entitled to and replace it with cars that run on an energy source that is infinitely abundant! SERVe is one such step in that direction. The team seeks to improve on its work every year and thus has begun working on its third car. Buoyed by SERVe’s success and using it as reference, we at SolarMobil aim to build a new prototype and reach the American Solar Challenge, 2016. The competition is a 2000 km endurance race and is a melting pot of budding engineers and industry stalwarts who are vying for a cleaner and greener tomorrow. The challenge is backed by the Innovators Education Foundation (IEF) & the Fédération Internationale de l’Automobile (FIA). With the next car we aim to achieve greater speed and more power while focusing on driver ergonomics. For more updates on the next car, catch us on our blog. We had a Photo-Shoot ! Questions and Answers about Manipal’s Solar Car team. Introduce the team members. (Eg. class and course). The team of Solar Mobil was started in 2011 with a vision of innovating and engineering towards making affordable Green Technology. 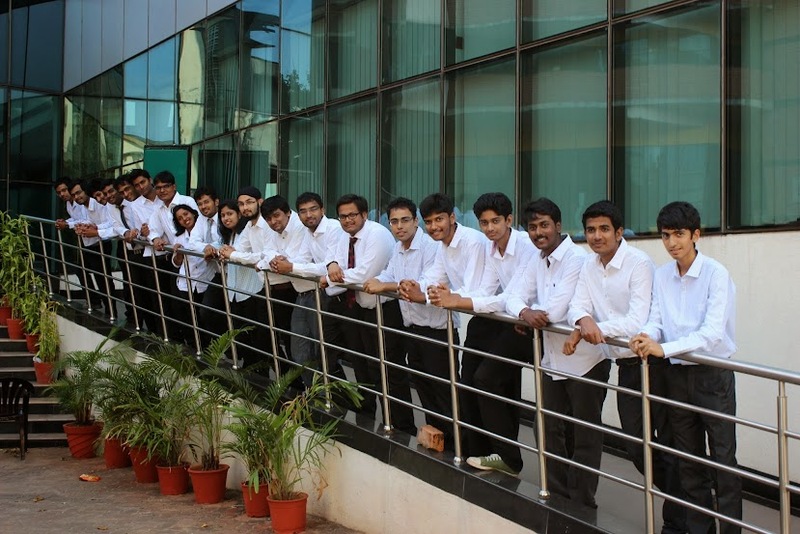 Our team comprises of 32 undergraduate engineering students from Manipal Institute of Technology. The team is interdisciplinary – consisting of students from Mechanical, Electrical and Electronics, Electronics & Communication, Instrumentation & Control, Mechatronics, Industrial Production and Automobile Engineering. There is an even mix of students from all 4 years which are guided by the faculty of the college. The team is broadly divided into three categories– Mechanical, Electrical and Electronics, and Management. Each of these has a number of subsystems under it for better organized planning. We started our first project in 2011 with the car Freyr1 which was a single seater solar electric vehicle prototype. The idea cropped up while thinking about the global environmental scenario. The depleting fuel sources. The rate of hike of fuel prices is exponentially increasing. So we wanted to make a car which doesn’t pollute the environment and use the free energy (solar) available to power the car. 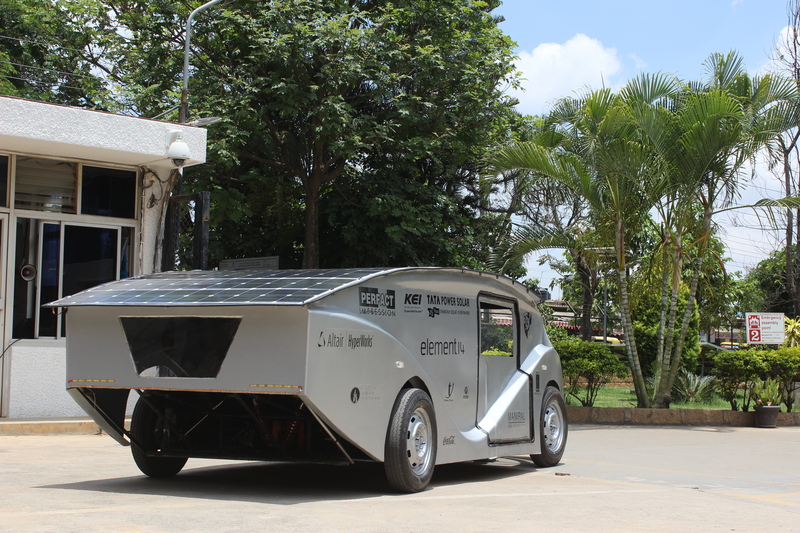 Our current project “Serv-E : Solar Electric Road Vehicle” is four wheeled two passenger seater solar electric vehicle. We want to show to the world that a solar electric vehicle is a viable alternative. The length of the car is 4.4m ,width of 1.75m and height of 1.28m and weighs only 400 kgs. It uses 6m^2 monocrystalline silicon solar panels which can generate a power of more than 1kW at an efficiency of 20% which charges a battery pack consisting of lithium ion cells at a capacity of 13kWhr weighing 63 kg which gives the car a range of 250+ kms. Currently at what stage of production is the car? Our planning has 4 phases i.e., 1) Preliminary design phase 2) Design and analysis phase 3) Manufacturing and assembly phase 4) Testing phase. We are currently in the manufacturing phase. The chassis construction and suspension system mounting is completed. We plan to complete the assembly by the end of April after which we will move onto the testing phase which will consist of – mechanical component and compliance testing, electrical systems testing and safety testing. The major challenge before you and how do you plan to deal with it? ( eg. financial). Since the energy generated from solar panels is very less. So, we try to save energy in every aspect possible. Throughout our project we have faced a lot of challenges in making the car aerodynamic, light weight and efficient. Hence we need to have a very efficient power train system i.e, an efficient motor is a must which was provided to us by Agni motors which is 96% efficient. Also, financial glitches are a part and parcel of student projects, as many of the electrical components have to be imported. We are still in slack of monetary funds to purchase the electrical equipment and looking for perspective sponsors. We approach sponsors through various means for eg., attending various conferences and making contacts. We are fortunate enough to have companies trying to make this world a better place. Presently various companies are sponsoring in kind and monetary- TATA Power Solar, Altair Hyperworks, Agni Motors, Element14, MSME, Kelly controls, Technovision tools, KEI wires, Ewert systems, Novergy, Perface Impressions etc. However, the team tries to manufacture the mechanical components in-house to reduce the costs as much as possible. Describe the competition you would be participating in. The other teams from India that would participate in the event. We look forward to participating in the Sasol Solar Challenge in South Africa which will be held in September 2014. The event is an endurance race that covers over 3000KM. The challenge begins in Pretoria and ends 8 days later in Cape Town. Our aim is to finish this challenge in the least time possible, interact with international teams and try improving our technology. It also serves as the best platform to test the endurance of our car across the varied conditions of the South African terrain. 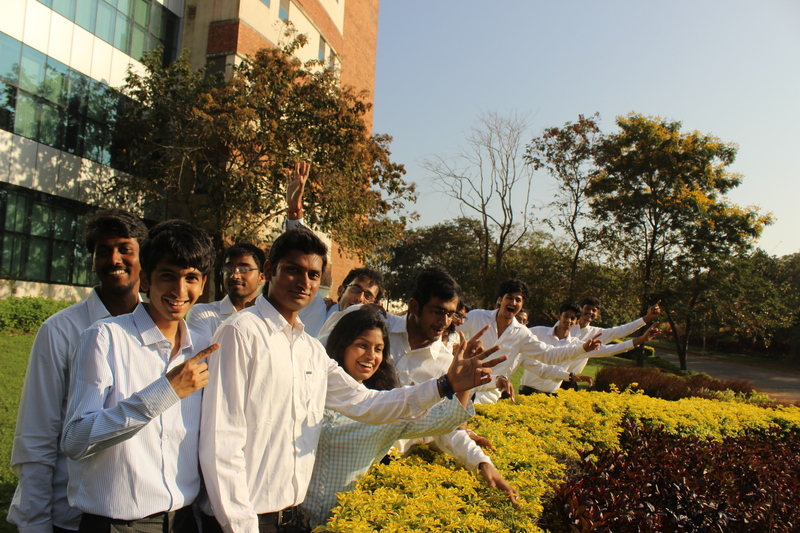 SolarMobil Manipal is the only Solar Car Team in South India. The other two teams from India are the NSIT Solar Car & the DTU’s Solaris. However we cannot comment on their participation in the event. How do you plan to face the event? Is this for the first time that Manipal University is participating? Yes, this is the first time that SolarMobil, the solar car project of Manipal University would be participating in the South African Solar Challenge. The key to any endurance race is to plan the energy consumption and strategize every move and we have closely analyzed the World Solar Challenge & SA Solar Challenge races over the past two years to make sure that our vehicle is fit for all kinds of scenarios. Also, as per our timeline, we plan to finish the car by April so that the remaining time can be utilized in the testing of the car. Faculty who have helped you. SolarMobil Manipal has a productive student – faculty interaction. Our Team Faculty Advisor – Mr. Umananda K.V. and a technical advisory committee consisting of ten professors from various branches guide us through the various stages of the project. Any innovative means to get sponsorship. (Like adopt a solar cell) Elaborate on the same. We successfully launched our first vehicle Freyr1 last year. Although the project seemed ambitious to begin with, it turned out to be a prototype car for us. This year, we plan to make a car that is not just technically sound, but also a commercially viable option that can seat up to four people. We have come up with a campaign called ‘Adopt a Solar Cell’ in which we name each solar cell mounted onto the car to the person who has ‘adopted’ it, creating the much needed awareness about possible green innovations in the automotive sector. For the first time, we are creating an automobile which is not just eco- friendly, but is ‘energy positive’. Our car is actually capable of producing energy that can be given back to the grid. Imagine a world with many solar cars which can create a power house at every parking station. When would the car be ready and how confident are you about the competition. How would the preparations go on? With the present progress of the car, it will most likely be ready by mid- April. Although this is the first time we are participating on an international scale, our previous car has provided us with enough experience and expertise in this area. We are confident of our car’s caliber to compete with other international teams at the competition. Making the car is an early stage of our project. For the competition, testing of the car and acquiring data and comparing with design values will prove to be a crucial point which will decide our performance eventually. This stage is where we, as students, will be able to learn the most. We are proud to be a part of Manipal institute of Technology, a constituent institute of Manipal University. The college always supports various student projects which a very good gesture for strengthening research from the core. The college also has FSAE team, BAJA team, Robo con and NASA lunabotics team, SAE Aero design team etc on the technical side. All the projects are scrutinized by a board of elite professors, Director and Joint Director known as Student Project Scrutiny Board (SPSB) headed by Dr. N Yagnesh Sharma, Associate Director for Development and professor of Mechanical engineering department. Everyone in the board is always striving to improve the project inspiring us throughout the process. Our project SolarMobil complements the university’s motto of green university. We are still new to the field but intend to be good completion to other international team in coming years. We would also like to give back to the student community, we encourage students from various colleges to take advices and we always reply to the queries asked to us, to inspire other teams from India and to contribute to the cause. The car for this season has been named as “SERVE ” which is an acronym for Solar Electric Road VEhicle” is four wheeled two passenger seater solar electric vehicle. The idea behind this car was that we wanted to show to the world that a solar electric vehicle is a viable alternative to internal combustion cars . The length of the car is 4.4m ,width of 1.75m and height of 1.28m and weighs only 400 kgs. It uses monocrystalline silicon solar panels which can generate a power of more than 1kW at an efficiency of 20% which charges a high power battery pack consisting of lithium ion cells which gives the car a range of 250+ kms. The team has finished 90% of the chasis manufacturing process and would soon begin mounting various electrical components into it.